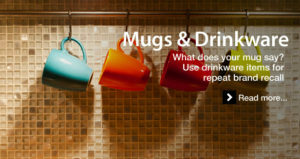 Drink Bottles, Mugs and Cups, Travel mugs, Reusable Coffee Cups and Glassware with your Logo. From a morning cup of coffee to an evening glass of wine, our personalised drinkware are items everyone uses every day. Because they’re useful and universal, glasses, cups, drink bottles and mugs are the perfect promotional trade show giveaways and custom gifts for businesses or personal use. See our range of Mugs and Drinkware at Stateside Promotional Merchandise.